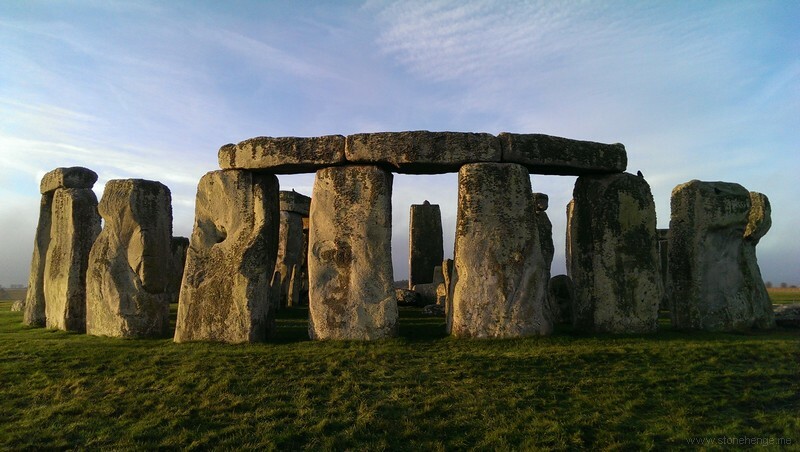 There is no definitive data set for Stonehenge measurements. 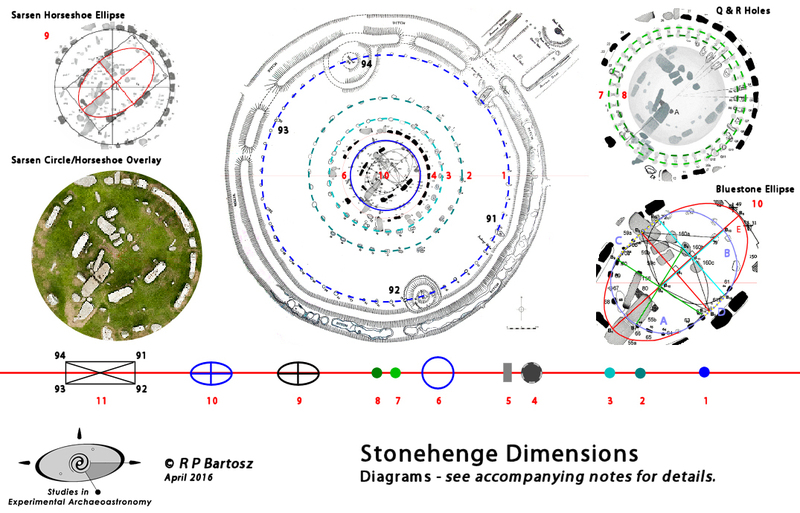 There can never be because the various dimensions quoted come from surveyors who undertook their respective surveys in different epochs and the state of Stonehenge's construction varied greatly. Comparing, just as illustration, Petrie would have undertaken his at a time when the stones were in disarray - the lintels over uprights 29,30, 1 and 2 would have been leaning heavily outward - and current plans, however apparently accurate such as Anthony Johnson's (AJ) were prepared considerably later after a great deal of restoration. So we can rely on AJ's plans as being perhaps the most precise available (at least publicly) in terms of post-restoration, and the high resolution offers opportunity for creating a benchmark. But, in turn, these rely on the restoration having been accurately undertaken, which however painstakingly expedited, is open to question. 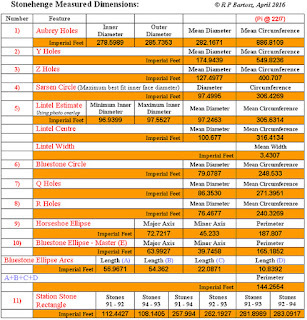 Equally Petrie's measurements, often used as "definitive" in many instances, actually can't be confidently accepted due to the condition of the layout at his time of survey, and he will have no doubt made assumptions and educated guesses. As a result the door has been left open for various researchers to "adjust" dimensions to fit their own particular ideas and hypotheses. Unfortunately there is no way that any one researcher can actually be proven wrong, and the veracity of any hypothesis linked to "definitive" measurements, i.e. claimed to be the ones that were actually designed into the monument will depend on the quality of argument, supported by scientifically accepted evidence. Most hypotheses, both from academia and independent researchers fall far short of scientific rigour. In this brief context, I have prepared a set of preliminary dimensions as in the images below. The purpose is to present dimensions, in one location, which have been scrutinised by both academia (hopefully) and independent researchers, from which existing theories can be rigorously reviewed or new hypotheses more confidently presented, whenever dimensions are involved. I've used various sources and put them together to produce a couple of high resolution plans - within practical means - from which the dimensions were determined. At this stage I am just presenting the first set of dimensions to start the ball rolling, together with a diagram which is more or less self explanatory. I am preparing an accompanying set of notes detailing the methodology and explaining which can be taken with a finer tolerance as opposed to others which have to be treated with greater caution, or simply can't be trusted at all. However, I will be looking initially to first reactions and comments as to which other dimensions should/might be included, to see if the plans I have will cover them, or how they might be best measured before adding to the list. It will be a work in progress over the coming months, with a view to creating that one stop answer to much of the confusion that appears to exist. Please note that all measurements are in Imperial Feet. People will have to convert, to whichever hypothesis they are pursuing, themselves. It is not the purpose of this data set to support any particular theory - not even my own! All dimensions are rounded to four decimal places maximum. Lots of figures!! 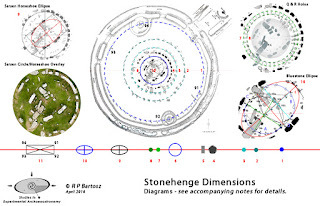 If you into that side of the construction finding the 'megalithic' standard foot and yard might be interesting? I know other people have tried.. but in my view not got it quite right!! Not sure what you mean. If people have tried but "not got it quite right", do you mean you have tried and consider that you have got it right, or do you mean that you don't agree with their methodology but don't have an alternative to offer? My view is that there is no "right", only theories which firstly have to fit within the tolerances of the figures provided and secondly, if they do, then they must be supported by evidence of substantial credibility. This, of course applies to my own hypothesis. As yet, I haven't published the details although I have given many a clue, but there are several elements which need to be polished up before I do. The figures aren't so much as "many", more the key features which other people use to attach measurements to are identified, but as I read on a very selective basis. Sometimes they use, for example Petrie's, sometimes Thom's, sometimes claim their own as being the "right" one. 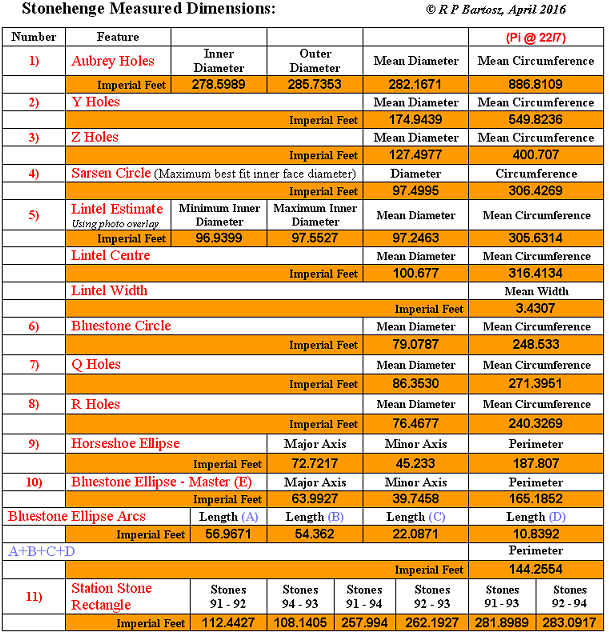 The table I have created puts the dimensions of the key features in one place for others, including general readers, to use as an unbiased working sheet of the tolerances. At this stage the table is open to comments and in due course I will follow up with detailed explanation as indicated. Thorn's unit of measurement of about 2.72 feet (0.83 m), which doesn't seem to match your stats - so do you have an alternative measurement? Firstly, they are not my stats. This exercise is to try and set out the tolerances as accurately as possible for any researcher to use when pursuing their own particular hypothesis/es. People like Anthony Johnson have applied modern technology, namely computer power and CAD software, to analyse but seem only to want to divulge very selected results. I'm trying to repeat the exercise with my expertise to cover all the dimensions and share them freely with anyone. Furthermore I believe my methodology, source materials and results have to be open to discussion and scrutiny. This is happening at the Megalithic Portal, and this first set of data is just stage-1, so that's a better place to follow dialogue and progress. I thank Tim for recognising the potential importance of this data, all in the one place, to the alternative research community and highlighting it on his blog. I agree regarding Thom's MY. But it's far more complicated and a considerable amount of discussion is going on at the same Portal mentioned above. As it happens, my research entirely supports the 2.72 but we're talking about a range of units he identified all well beyond discussion here. The significance of the 2.72 is not just as a number or measure but its relationship to many other factors, so it's not as simple as just dividing the number into any one, some or all of the dimensions. That's not how modern metrology works nor, as logic suggests, ancient metrology would have worked.